As a small independent online business, it can be a challenge to bring awareness to a product. Of course, small businesses don’t have a gazillion dollars to advertise on a large scale. As a result, if a business can’t get their name out, potential customers won’t know they exist to even begin looking for them. Urban Running Girl has been extremely fortunate. In regards to receiving additional blog and media exposure, the month of November has been AMAZING for Urban Running Girl. There have been two outstanding blog reviews from JillWillRun and The RUNiverse. As well, the editorial content from Get Out There magazine and iRun has been fantastic. I am most grateful for all the support, not only from the bloggers and the media, but from everyone who has taken a moment out of their busy day to read or comment on any of those blogs or magazines. As well, those who have commented on URG’s blog, FB page, Tweeted or sent us a private email. Thank you, Thank you, Thank you. Your support has been awesome and I truly appreciate it. As November comes to a close, there is one last blog review from Push.Pump.Progress. Push.Pump.Progress is our first Canadian blogger to review Urban Running Girl and the response has been wonderful. I’ve copied most of the review below, however, the full blog can be read here. Urban Running Girl Review & GIVEAWAY!!! I hope you are all having a great start to your week and that you are all getting ready to participate in this weeks Frosty Fitness Challenge! As if you needed an excuse to work on your push up skills! Since I just got engaged and since it is the Christmas season (a definite time for giving!) I thought it would be a great time to do another review and GIVEAWAY!!! 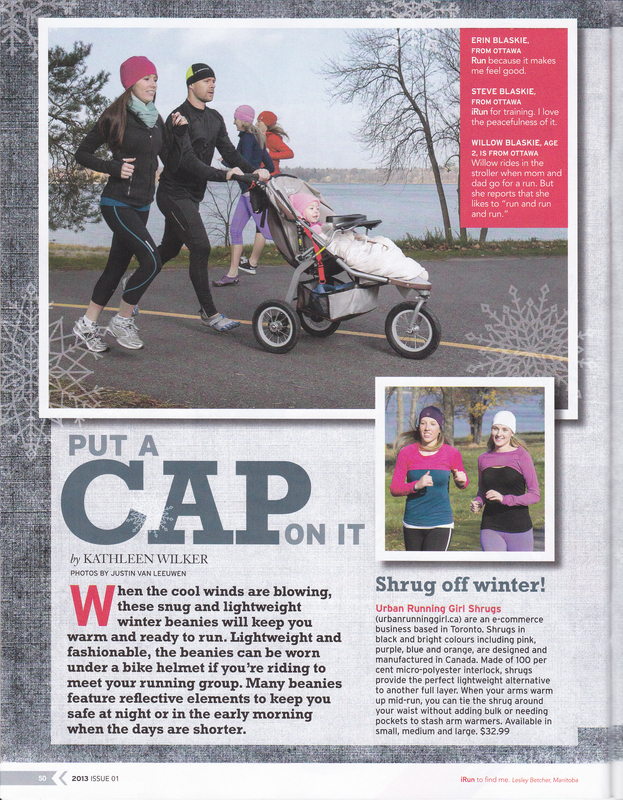 Last month a stumbled upon a local Toronto based company called Urban Running Girl. Urban Running Girl makes running shrugs…. yes that’s right RUNNING SHRUGS! I was very intrigued by this product so I contact the owner Deb to get more information. These shrugs are designed for active women! “The idea of a running shrug came about from the need to keep warm while warming up during an early morning run, particularly in the spring and fall. It’s too cool to start with only a tank top or t-shirt, but once warmed up and/or the outside temperature rises, it’s too warm for a long sleeve shirt or jacket.” How many of you have faced that problem when out for a run?? I know that I have on several occasions! Wearing a jacket or long sleeve shirt over a tank top when running can be very frustrating. For example you start to over heat but don’t want to stop to take your jacket or top off, jackets and tops tied around your waste can really weigh you down, zippers and Velcro can chafe, and if you over heat during a race you have to re-pin your bib if you take off your top layer! Now all of those problems have been solved with this unique little shrug! to cover your hands on cooler days. 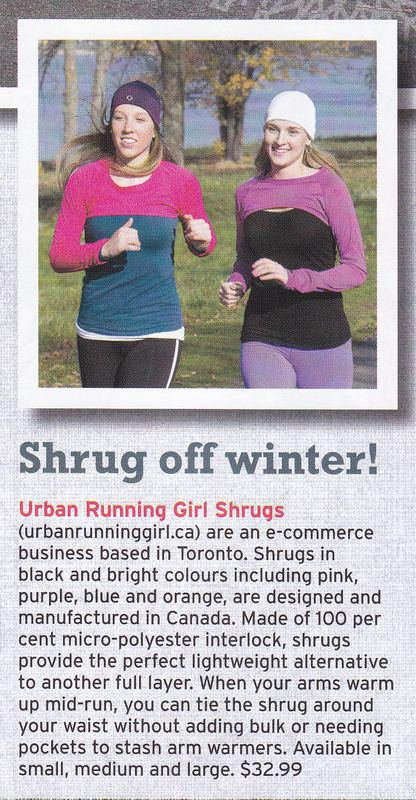 What I REALLY like about Urban Running Girls is that the shrugs are all designed and made in Canada!!!! I am all about supporting Canadian made products! Wow! Time flies! I looked back at my last blog post and realized I’d better get cracking at writing something new! This week has been a busy one. Firstly, I’d like to give a shout out to my American cousins. I hope you are enjoying a wonderful Thanksgiving weekend, and perhaps in the midst of all the festivities and good food, you’ve had some time to work it off with a good run or two. If not, perhaps you are running around at the shopping mall, seeking out great Black Friday deals! 🙂 Either way, you are keeping active! Woot! This week I took some time to begin the big clean prior to Christmas. I’ve been working up a sweat, moving furniture around, dusting, purging some items and getting my house in order. A whole day was given to the pantry as I had to reorganize. It really hasn’t been that long since I did this, but of course, I had to go through everything one by one, checking expiry dates on foods. As well, checking our current baking supplies so we know what to purchase for the holiday season baking list. Unfortunately, I had some expired Gu sitting in the back of the cupboard which I had to dispose of which didn’t make me happy. 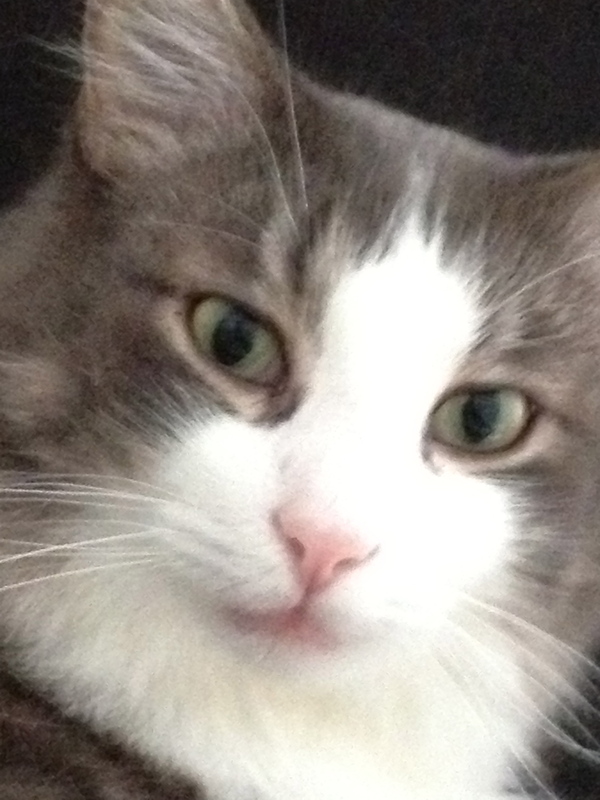 I did get my Christmas tree up this week (without decorations) on account of this guy…..
Don’t let him fool you. He’s full of beans! The tree went up as this will be his first Christmas with us, so I wanted to make sure he wouldn’t climb it and take it down. So far, so good! On a business front, Urban Running Girl has also been featured in the lastest issue of iRun magazine. Urban Running Girl featured on page 50 of iRun magazine 2013 issue 01. Tonight I am off to see The Who in concert. I don’t generally attend many rock concerts nowadays, however, this is one band that seemed to escape me. Back in 1989 they played in Toronto and as luck would have it, on the exact same night, I had my high school graduation. I’m sure they’ve played here since then, but of course, I missed that too. So tonight, I get to pretend I am 18 again, and relive a moment I once missed! However, with that said, I won’t be teasing my hair. Hee hee! I hope everyone is having a great start to the weekend. Happy Running! Awesome option to keep your arms warm on slightly chilly days or at the start of races. You can tie it around your waist without adding a lot of bulk. Made out of soft material that washes well and even includes a way to cover your hands for warmth. I was initially unsure about the concept of the Urban Running Girl shrug. On one hand, it seemed like a potentially smart idea but on the other it seemed like a potentially strange idea. It wasn’t until I tried it that I truly saw the beauty of this product! 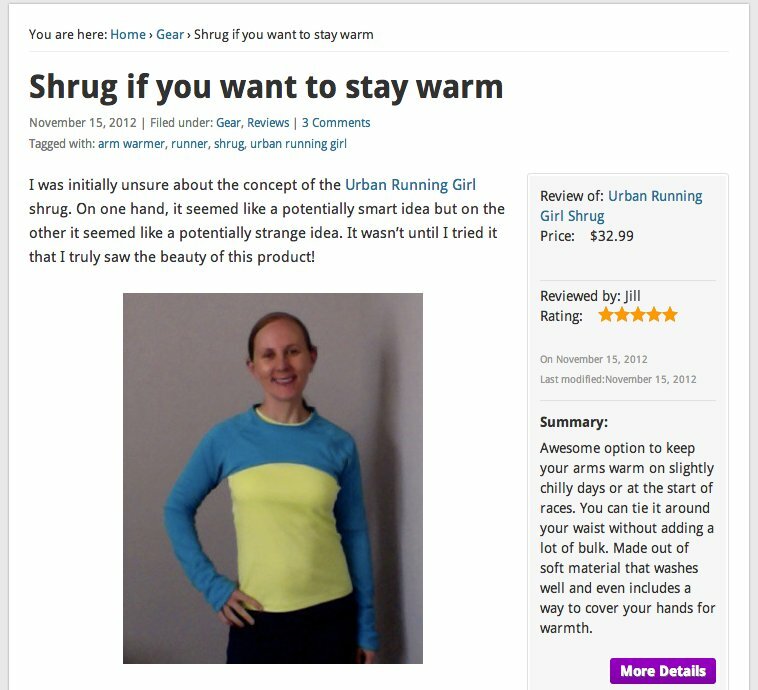 The Urban Running Girl shrug is basically a shirt… without most of the shirt! It covers the arms and shoulders, making it lightweight and easy to remove when you no longer need that layer. Plus, unlike arm warmers where you have to find somewhere to stash them once you’re done with them, this can tie around your waist without nearly the bulk that a jacket adds. This is perfect for cool morning runs (I live in Las Vegas, this could even be used for winter running!) and it’s a perfect option for races with cool starts. You can wear a tank or singlet and top it off with the shrug to stay warm. Your race number will stay expose while you stay warm until it’s time to remove the shrug. It has handy little pockets at the end of the sleeves. No, these pockets aren’t for storing stuff, they’re to tuck your hands into when you’re shivering in the starting corral or just need to keep your paws covered for a little while. The shrug is a nice soft material and it washes up beautifully. On the back the website for UrbanRunningGirl.ca is featured… so others will know where to get one after they are jealous of your shrug! You can use this for more than just running though. You could stuff it in your bag and pull it on in cold movie theaters (Does every place keep their movie theaters sub-zero? Vegas ones are cold!) You could slip it on over a t-shirt while working in the yard or just sitting in your office. (That’s been tested… it worked well!) I’m a fan, I think this is a smart design! The business is based out of Canada and you can order from them online. Orders can be shipped to the US and Canada. Urban Running Girl makes the cut! Get Out There magazine Holiday 2012 issue Page 20. Highlighting Urban Running Girl. 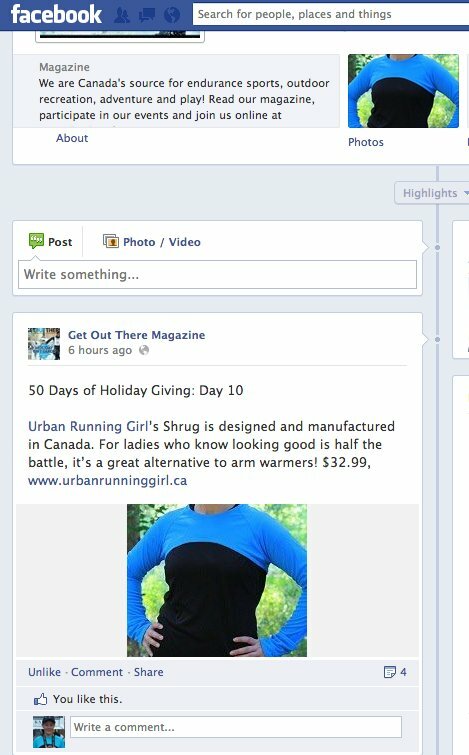 As well, Urban Running Girl was highlighted on Get Out There’s Facebook page for Day 10 of their Holiday Gift Guide! Not too long ago when we were contacted about reviewing a running shrug, my initial reaction was… huh? A shrug for running? I guess I’ve always seen shrugs as a fashion accessory, not a functional piece of clothing. Why would I want to wear a shrug while running? This was taken a few years ago when I ran the Nike Women’s Marathon with Team in Training. The race started near dawn on a cold, foggy October day in San Francisco. We had trained through the heat of the summer in the desert and starting the race in only our TNT singlets was out of the question. We wore throw-away shirts instead knowing that over the course of 26.2 miles we would warm up. Unfortunately before we were warm, we encountered several of the official race photographers. Not wanting to miss out on our photos, and still wanting to show our TNT pride, we ended up with lots of pictures of us “flashing” our TNT singlets to the cameras. All this could have been avoided with an Urban Running Girl shrug! That’s because a shrug only covers your arms and your shoulders, leaving your race number visible to photographers. Besides the race number issue, a shrug is also nice if you are wearing a shirt you want to show off (perhaps if you are running with a charity, group or team). Shrugs allow you to stay a little warmer and still show your team spirit. And when you are ready to take it off, it easily ties around the waist without all that extra fabric flapping in the wind. Post run this morning in my Urban Running Girl Shrug. I used the size chart on Urban Running Girl’s website to determine what size to order. When the shrug came I was impressed that it fit perfectly. I wore the shug over a running tank on this morning’s early run and found it to be extremely comfortable. It was about 60 degrees and mostly dark when I set off around 6 am. (Did I mention I love this time of year here in Phoenix?) About 3 miles in, my body was warm and sweaty so I yanked off the shrug and tied it around my waist. I hardly noticed it after that. The fabric is soft and silky, the cut is comfortable, and the little cuffs to keep the hands warm are a nice touch. Overall, I have nothing but praise for this product. I was just doing a search tonight on the internet, and came across this wonderful blog by SOCCERAT32. I loved that she felt like a “bad*ss” wearing it too! It’s different, and of course, with anything different it stands out! But hey…I betcha you looked pretty cool in it! I needed a little pick me up today. With THE COLD last week and the pinocchio run yesterday I was feeling down on running, on exercise in general and especially on waking up. It is funny how the world works though. I spent last night gritching to Husband about how stressed out I was and how crummy my running was because I had to take an entire week off. You know what he said? Sure all those things are true but aren’t you excited to try out your new shrug tomorrow? Why yes, yes I am. Sure enough my new running shrug was just what I needed!